DATA SECURITY IN A CHANGING WORLD. We live in the era of digital disruption, when always-on connectivity, a mobile workforce and globalization leave us more vulnerable than ever to cybersecurity assaults. In this brave new world, keeping customer and company data safe is a seemingly insurmountable challenge. THE EVER PRESENT THREAT OF A DATA BREACH. Threats are increasing, but some IT admins are stuck in the security paradox. WHY THE WALL WON’T PROTECT YOU. Data everywhere, overwhelming security threats, hackers seeking vulnerabilities – paralyzing alarm fatigue and paradoxical viewpoints are natural responses to a problem that exploits the weaknesses (and underdeveloped strengths) of the modern workforce. SECURITY IN THE DECENTRALIZED WORKPLACE. Today’s workforce is in a state of flux. Work habits considered standard just a few years ago are growing outdated, with emerging trends – including cloud-enabled anytime / anywhere work schedules – disrupting traditional practices. Learn more about how HP can help protect your company. In today’s changing employee environment, where numerous entry points are spread across a decentralized workforce, it’s critical to adopt new, holistic approaches to data security. 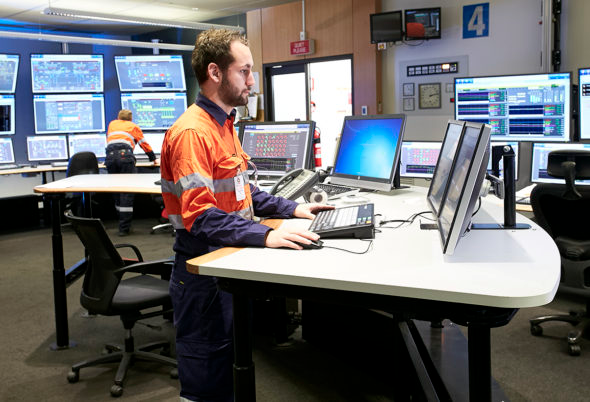 Holistic security allows workers to connect when and where they need to, via secure connections that authenticate users accessing the network. And it empowers IT professionals to tackle cybersecurity threats regardless of their origin. A security ecosystem complements – not conflicts with – how work gets done. An ecosystem of protection delivers endpoint security when and where it’s needed. Google first showed us offices could be fun. But between the playground slides and the ping-pong tables, the tech giant’s interior can be a little daunting for those not accustomed to a fun-filled office space. Fortunately, office design has matured. Research and tech are now coming together to make intelligent, beautiful, surprising and comforting office spaces that boost productivity, while keeping people happy and healthy. It’s the office you actually look forward to visiting. Less campus, more comfortable. We take a look at some of the most popular office design trends. Office work is fundamentally unhealthy. It’s sedentary and the spaces are notoriously poorly ventilated. Design for healthy movement promotes human activity and air flow. Both have a huge influence on productivity. 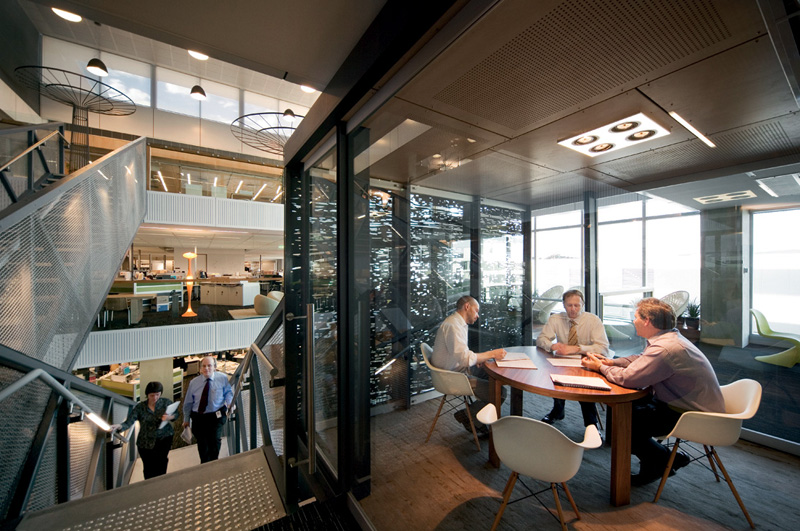 The World Green Building Council’s (WGBC) 2014 report on Health, Wellbeing and Productivity in Officesmakes a strong case for investing in better air flow with research suggesting that good indoor air quality can boost productivity by up to 11 per cent. 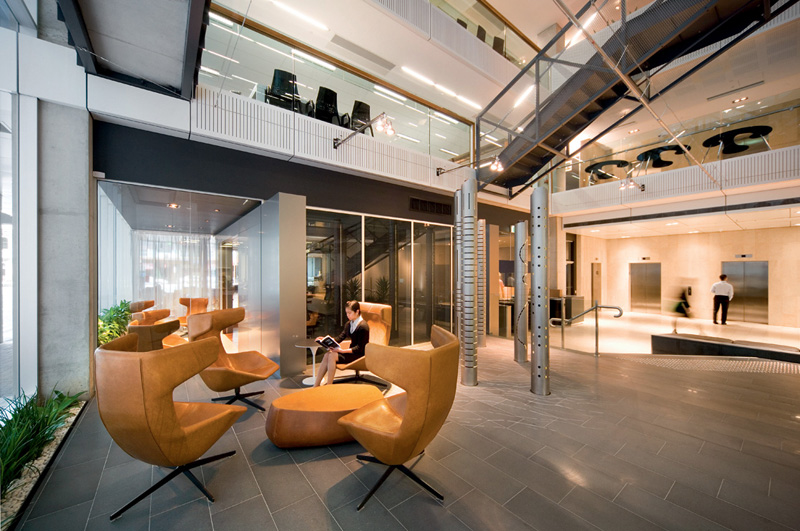 Stairs, flexible work stations and smart stand-up spaces can also boost efficiency and wellbeing. 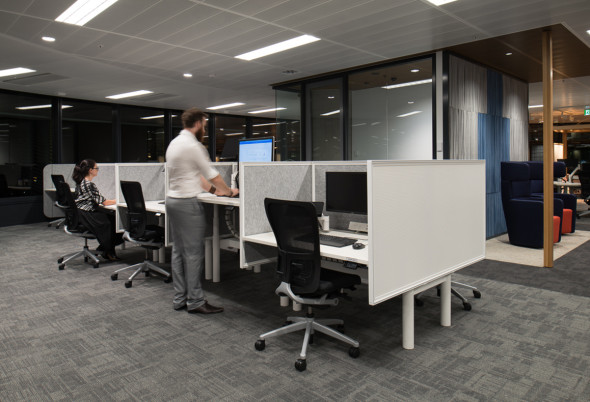 They accomplish this by giving people the freedom to move about, encouraging socialisation and providing the option to work from a quiet corner of the office. Diversity and choice are key when it comes to positive work environments. Take for example, Facebook’s sprawling office in Menlo Park, California, which boasts the largest open floor plan in the world. This freedom for the staff to move about and keep active is also complemented by a 3.6-hectare rooftop park. Think about your home. Your morning coffee in the sunroom. Your book in bed. Your late nights in the study. Your Netflix binge while glued to the couch. You’re doing different things in different places, and each space is designed to make you most comfortable while doing it. That’s the future of office design. 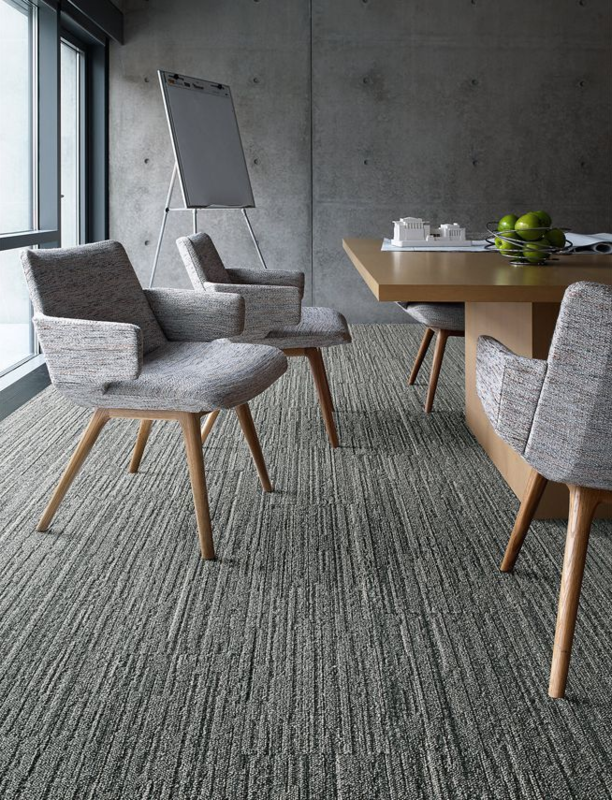 “This is particularly evident in European workplaces where designers are combining elements of residential architecture and home comforts, predominantly through the use of textiles, with functional office solutions to create relaxed commercial spaces,” says RIBA Journal. Airbnb has taken this ‘residential inspired’ approach to the next level by designing its San Francisco HQ meeting spaces after its various residential listings. Businesses can embrace ambient computing by designing spaces that perfect lighting, air temperature and airflow through sensors and signals. Comfortable people work better. It’s that simple. Nature-inspired commercial design goes hand-in-hand with emerging residential influences. Textures, lights and colours that help reproduce an outdoor setting can sooth urban employee stress. 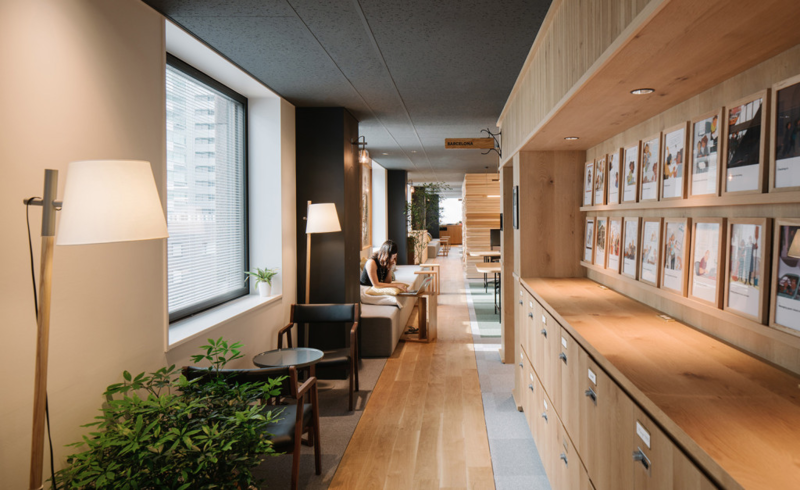 Airbnb Tokyo extensively researched what its staff wanted before starting its latest office redesign. 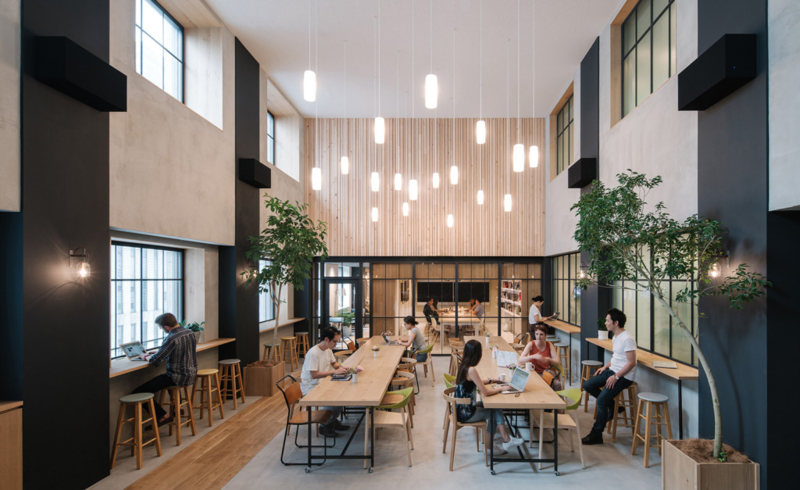 “In response to employee feedback, nature was heavily incorporated into the new design to create a peaceful working space where employees can escape the chaotic urban environment of the local area in Shinjuku,” says the Australian Design Review. The WGBC’s 2014 report also pointed to several studies showing productivity was connected to proximity to windows, especially where views offered a connection to nature. 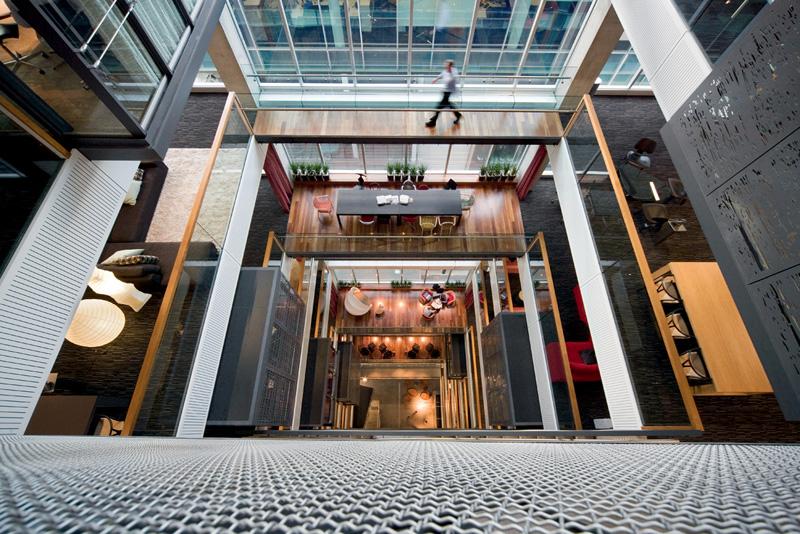 The physical health of employees is taking centre stage in commercial design. The communal work table, height-adjustable desk, lounge space, breakout space, stairs and more flexible working spaces are all designed to get people moving. But designing for employee health lends itself to healthier social spaces too. Moreover, open break rooms, cafes and foyers that allow for casual conversation when people cross paths can boost the social capital of your office space. These chance encounters help take talk offline and inspire cross-team collaboration and break down the walls of the traditionally siloed department. Take LinkedIn’s New York office, for example, where the employees can use a number of communal areas for socialising and open-spaced meeting areas. This is designed to not only keep workers engaged, but also to encourage teamwork and interaction. Even making just a few of these workplace changes could ultimately make a big difference to the productivity and morale of your team. In an environment of fast change and constant innovation, businesses can’t afford to let old technologies slow them down. Modern businesses that are agile enough to adopt the latest productivity-enhancing technologies gain significant advantages over their legacy-laden competitors. A recent Harvard Business Review feature emphasized the useful distinction between ‘economic’ obsolescence (when an asset reaches the end of its accounting life) and ‘functional’ obsolescence (when an asset doesn’t help its owner remain competitive). Unsurprisingly, businesses that plan to replace assets when they’re functionally obsolete are generally more competitive than those that replace them only when they’re economically obsolete. This may sound esoteric, but most workers intrinsically understand that they need the right tools to do their job. Ernst & Young’s 2014 Australian Productivity Pulse report found that “35 per cent of workers reported being hindered by issues with legacy IT systems, while 70 per cent said their productivity would improve if they had faster access to more accurate data and analytics allowing them to make better business decisions”. We understand that change can be difficult – expensive, uncertain and even intimidating. But businesses can’t let themselves fall behind their competitors. Technology startups have eagerly adopted mobile, cloud and other lightweight technologies that are funded from operational, not capital, budgets. This helps remove the problem of economic obsolescence and allows them to adopt competitiveness-enhancing new technologies. Their less agile competitors, meanwhile, are stuck with their existing investments in hardware and software while they wait for the clock to run out on their depreciation schedules. Staff morale can also be negatively affected by frustration with obsolete systems, which in turn contributes to reduced productivity and increased staff turnover. This reduces business competitiveness – it’s not just a theoretical or HR problem. According to a Vanson Bourne survey, most IT departments (86 per cent) are fielding complaints from users about legacy applications. These obsolete technologies cause staff members to feel “bored, frustrated, ambivalent and restricted” and are considered a problem by nearly half (44 per cent) of all IT managers surveyed. Business agility is largely about adaptability, and workers know what’s at stake – Ernst & Young’s survey found that 33 per cent of Australians believe their role may not exist in 20 years because of emerging digital technologies and automation. Australia’s economy is changing and services of all kinds are taking over from traditional sectors like manufacturing, mining and agriculture. Knowledge workers will drive growth and productivity in the new economy. They need to keep on learning new skills and adopting new technologies. Businesses that want to retain their skilled workers and their competitive advantage thus need to provide the latest tools and technologies to boost productivity and retain their staff’s trust and engagement. Only then will they thrive. Whichever way you look at it, it’s a simple equation: old technologies are less efficient, are a drag upon the workforce and reduce your business’s competitiveness. The good news is that the reverse is also true: new technologies are more efficient, are a boon to the workforce and increase your business’s competitiveness. And with the current low cost of software, hardware and services, there’s never been a better, easier or more important time to upgrade your business tools. It’s well understood that optimising technology in your business can lead to improved productivity, efficiency and profits. So it’s nice to hear that Australian research confirms the link between business investment in new technology and productivity growth. A nationwide cross-sector survey of CEOs found more than a third of businesses that invested in new technologies in 2012 reported improved labour productivity, compared to just 16 per cent of businesses that did not invest. That’s consistent with long-term trends, with Australia’s ICT-intensive businesses showing labour productivity gains of around 45 per cent in the last decade, compared to the average across industry sectors of 13 per cent. Employee knowledge and skills had the most significant influence on the productivity gains that businesses realised from investment in technology, according to the Australian Industry Group National CEO Survey. Supply chains were the most common source of information on new technologies. Over 50 percent of businesses learn about a new technology from a client or supplier, with demands from supply chain partners and customers providing the impetus to invest in technology. Despite bipartisan support for high-speed broadband in some form, less than half the companies surveyed were ready to take advantage of the opportunities broadband will provide. Most businesses cited improved collaboration as the key benefit of access to high-speed broadband, with other advantages including lower transaction and communications costs. Businesses also expect broadband to provide better support for cloud computing, video conferencing, remote monitoring and sending and receiving large files. Technology investment has flattened since 2008, with the outlook for business conditions still the biggest influence on decisions to invest in technology. However, for Australian businesses to grow and remain globally competitive, investment in technology and staff training will be essential. Cloud vs hardware: What’s right for your business? The cloud is touted as a technology that, along with mobile and analytics, will usher in a new age of limitless, on-demand computing for everyone. According to a Telesyte study,1 total market value for public cloud services is tipped to reach $775 million by 2019, with infrastructure-as-a-service (IaaS) enjoying the biggest spending increase in 2015. But is the cloud always the right choice for the small to medium business (SMB)? There are a few important deciding factors to consider when choosing between cloud services and on-site server hardware. A major selling point of the cloud is its flexibility. Typically, businesses will purchase a monthly plan that includes a bundle of features that meet their needs. As the business grows or changes, it can move between plans. For example, you might choose to start with a basic data storage, CRM and email management plan, and move to one that includes advanced data analytics later. Your business model will be the deciding factor. Are your employees working from a static location, or remotely? If it’s the latter, there can be less chance of data loss or duplication with the cloud. Are you unsure where you’re going, or confident that things will remain fairly static? If you don’t expect to scale quickly, it may be more cost-effective to purchase your own entry-level server outright. Choosing a solution that’s easily upgraded will mean you’re well placed for future growth. Although there are ongoing costs associated with hardware – such as upgrades, power and troubleshooting – the cost of a physical server over such a period rarely adds up to the cost of cloud services. This is despite the cloud appearing cheap on a month-to-month basis compared to the higher initial costs of physical hardware. In general, the flexibility and scalability of cloud may make it attractive for larger companies – but smaller businesses are unlikely to use the full range of cloud features they are paying for in their monthly fees. It’s also worth noting that your own hardware may be counted as a business asset, which has tax benefits. Some of the risk of using cloud relates to data security and privacy. In Australia, it’s important that SMB cloud users are aware of their rights in relation to the Privacy Act (1988),3 which states that cloud providers must take “reasonable steps” to protect personal data from unauthorised disclosure, misuse or archiving. Australian Consumer Law also applies to cloud providers, although penalties can be difficult to enforce if they are based overseas. When comparing cloud providers, find out whether they offer personalised encryption and data backup that protects your information if there is a breach or hardware failure. Also be sure to ask where they store their data, as privacy laws vary by country. A physical in-house server will typically keep you protected from all but natural disaster and physical interference. Like all ICT systems, it’s a matter of weighing up the benefits while managing the risks. To varying degrees, all cloud services will be subject to the congestion and unpredictable latencies of the public internet. This can be more of a problem for rural businesses that lack the reliable internet connection and bandwidth needed to consistently run cloud applications. Another important factor to consider is data transfer limits. Cloud services usually allow you to upload an unlimited amount of data to the server (on your own bandwidth dime), but are less generous when it comes to downloads – services like Amazon EC2, for example, are capped at 1GB free outbound data per month. The cloud can still be viable for SMBs that have a highly mobile workforce, want the freedom to scale up and down quickly, and can accept the risks of having their data handled by a third party. There is also the hybrid option, where non-critical business data is stored and processed using low-cost or free cloud plans. For many SMBs, however, maintaining their own on-site servers remains a more cost-effective and secure strategy. D1 VM, single core, 3.5GB RAM, 50GB storage. D2 VM, dual-core, 7GB RAM, 100GB storage. VPN Gateway, incl. 100GB each inbound/outbound traffic per month. Costs based on pricing from Azure as at 21/11/2016. Lenovo TS450 tower server with 3 years 24/7 4-Hour Response Warranty, Intel Xeon E3-1245 v5 CPU, 32GB RAM, redundant 450W power supply. Tape backup drive with 5 x 1TB cartridges. Windows Server 2012 R2 Standard Multi-Language. Windows Server 2012 User CALS. Cloud-based technologies are revolutionising teaching and learning, and Microsoft’s Office 365 Education offers sophisticated tools to do just that. Office 365 comes with a lot of the usual Microsoft software offerings, now bundled together in a subscription-based model. However, more importantly for school CIOs and IT education decision-makers, Office 365 features Education, a state-of-the-art collaboration product that has the potential to improve teaching and learning processes. Office 365 Education offers students and teachers a whole new way to communicate via cloud-based email, web conferencing and document-editing tools. It also provides access to applications and files from any connected device. 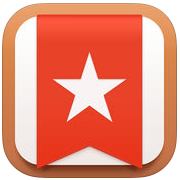 Recognising the popularity of apps, Office 365 also has apps that can complement its Education package. These include OneDrive, which offers 1TB of file storage per user and accounts that can customised according to a school”s needs; Yammer, a private social networking app that lets students and teachers communicate at any time; and Lync Online that enables audio and video calls. Additionally, students and teachers can share Excel, Word and PowerPoint files and simultaneously work on them from different locations, doing away with the hassle of needing to integrate document versions later. Office 365 Education includes Microsoft Classroom, a homepage where teachers can manage classes and assignments online. This can help with tasks such as organising multiple class sections (e.g. History or Geography A and B), creating assignments, collaborating with other teachers on syllabuses and providing students with feedback. 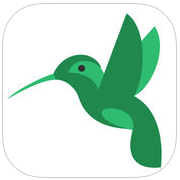 Students can engage with teachers and classmates as well as access class materials if they”re off sick, while apps such as Sway allow teachers to design interactive online lessons, assignments and even newsletters from a phone, tablet or browser. Office 365 also comes with protection against spam and viruses, making it a secure place to share documents. As a cloud-based service, it”s also logical to use Office 365 for data backup and storage. Office 365”s education tools allow for anytime, anywhere learning. They also incorporate new ways for teachers and students to collaborate on assignments and projects while allowing for better management of files on all devices including mobiles. Technology has advanced rapidly since the first Apple IIs and IBM PCs arrived in classrooms around the world. Today, schools have access to digital tools that were once the exclusive domain of the workplace. Student engagement is just one of the many benefits – because we know how much the typical K-12 pupil loves technology. “Procurement and deployment of the PC and other devices is about to be dragged, kicking and screaming, into the 21st century as a growing number of companies explore the potential benefits of PC-as-a-Service (PCaaS) and Device-as-a-Service (DaaS),” says Tom Mainelli, program vice president of devices and displays at IDC. According to a IDC survey from earlier this year, almost 25 per cent of IT decision-makers are already actively considering PCaaS, and a further 20 per cent say they plan to do so within 12 months. And it’s not difficult to see why. At one extreme, running a fleet of PCs in a corporate environment requires considerable capital outlay for their purchase and for the provision of the IT resources needed to maintain them. At the other extreme, these functions can be outsourced through leasing and support contracts, but that typically requires three separate relationships: hardware supplier, finance company and support provider. Most organisations will have a PC procurement and support regime that sits somewhere between these two extremes, but in any variant there are many hidden costs. IT consulting firm Nash Networks estimates that the purchase of hardware and software typically accounts for less than 50 per cent of the total direct costs. Nash Networks lists a whole set of indirect costs that it says can account for as much as 50 per cent of the total cost of ownership, and are often completely hidden. These costs generally arise through suboptimal maintenance and/or inadequate user support. They include lost or reduced productivity because of downtime and time spent by staff providing informal IT support to colleagues. A good indication of what’s involved in supporting a fleet of PCs under a do-it-yourself (DIY) model is MTC Training’s course, Managing Enterprise Devices and Apps Using System Center Configuration Manager (SCCM). SCCM is a product from Microsoft designed to facilitate the management of Windows PCs. The course is intended for experienced IT professionals who are typically enterprise desktop administrators. These are people who deploy, manage and maintain PCs, devices and applications. Managing desktops and devices in the enterprise. Preparing the infrastructure to support desktop and device. Managing client status, power management and remote administration. Maintaining configuration manager sites and site systems. If not leaving it up to a provider, a business would have to single-handedly conquer all of this. It could represent a costly undertaking, and might also be well beyond the capabilities and resources of an organisation. PCaaS replaces these with a single contract and a per-device monthly fee. PCaaS contracts are based on a fixed hardware refresh cycle, generally three years, with hardware and software support that includes ensuring software is kept up to date and, in particular, that the patches needed to keep systems secure are applied expeditiously. There’s also a strong argument for PCaaS purely on the grounds of optimal deployment of capital. Every business needs access to capital to fund its growth, and while PCs are vital to the operation of most businesses, the operation of the PCs is not core business. Capital can be more usefully applied to business growth if PC provision is made an operating expense. This is particularly true for startups and small businesses. The advent of Software-as-a-Service has reduced business small business costs enormously in recent years. Provided under an ‘as-as-service’ model, the PCs needed to access that software remove yet another barrier to entrepreneurship. PCaaS allows businesses to not only outfit their offices without having to buy everything outright, but also streamlines their IT support costs as part of the service. It’s important to be aware of these costs, as you don’t want to be left unexpectedly out of pocket when you budget in your PCs.